The party has decided to go full drain the swamp on the president's administration, after debating whether to target economic issues or alleged wrongdoing in the coming elections. WASHINGTON — Democrats are going to make prosecuting what they called a "culture of corruption" in President Donald Trump's administration a central theme of this year's midterm elections, the party's congressional leaders signaled Monday. "The swamp has never been more foul or more feted than under this president," Senate Minority Leader Chuck Schumer of New York said at a news conference on the Capitol steps. 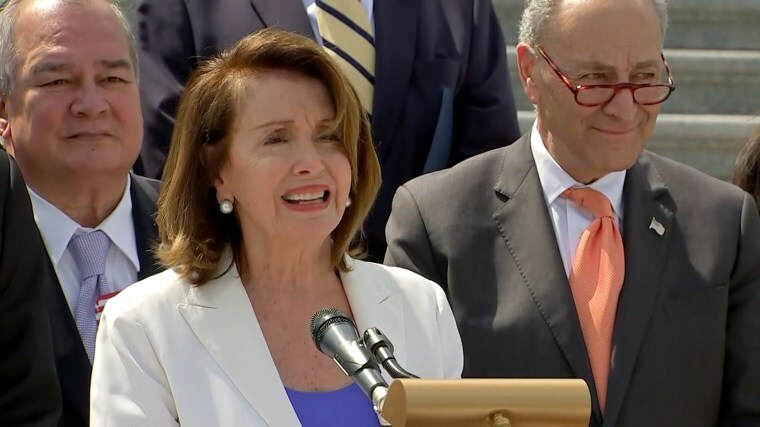 The strategy is a bit of a departure for Democrats, who have so far focused more on advancing their own economic ideas and middle-class pocketbook agenda rather than taking on Trump. But midterm elections have often functioned as a referendum on the president. And the strategy is acknowledgment that the opposition party may be better off swimming with the anti-Trump tide and harnessing the energy among progressives. "The problem is that a lot of people hear that (economic) message, they agree with that message, but they're not convinced that we can actually get it done because they view Washington as captured by special interests," Rep. John Sarbanes, D-Md., who helped craft the new strategy, told NBC News. "We realized that every other message we're putting out there needs to be accompanied by a democracy reform agenda," Sarbanes continued. "We think that that caffeinates every other message that we're delivering." He added at the news conference: "The people know what happens when a culture of corruption takes hold. Government works for somebody else and not for them." It's an effort to provide an overarching framework of the myriad and diverse scandals in Washington, from Scott Pruitt's Environment Protection Agency to the Trump-Russia saga, arguing that they all come back to a culture in which donors are rewarded, not voters. Voters are already primed for that message, Democrats argue, pointing to polling that shows the public thinks Republicans are more likely to be beholden to special interests than Democrats. On Monday, the party's leaders committed to a package of a good-government reforms and campaign finance changes to try to tap into the same populist revulsion with Washington that helped put Trump in office. "Instead of delivering on his promise to drain the swamp, President Trump has become the swamp," said House Minority Leader Nancy Pelosi, D-Calif. "Republicans in the White House and the Congress are cravingly beholden to big money interest and the American people are paying the price." That tone was notably different from the one the two leaders struck a year ago when they laid out the first planks of their "Better Deal" messaging plan in suburban Virginia. Trump was rarely mentioned. Instead, the focus was on giving voters a reason to vote for Democrats, and not simply against Republicans. "Too many Americans don’t know what we stand for," Schumer said. "Not after today." Just 27 percent of Democratic ads so far this year mention Trump, compared to 60 percent of GOP ads that mentioned President Barack Obama by this point in 2014, according to data from Kantar Media's Campaign Media Analysis Group. Democrats are not abandoning the economic message they rolled out then, party officials say, but rather adding another layer to their overall message to voters. Party leaders have been debating which approach to emphasize since shortly after Trump's election. At the same time, corruption has proven to be a potent political message, especially in midterm elections. Democrats, for instance, made disgraced lobbyist Jack Abramoff the poster child for it ahead of their 2006 wave. And when the country is in an anti-incumbent mood, the message is an appealing one for challengers who might otherwise struggle to be heard. "The minority party is never going to have as big a megaphone as the sitting president of the United States," said Jesse Lee, a former Obama White House aide who is now a senior adviser at the Center for American Progress.